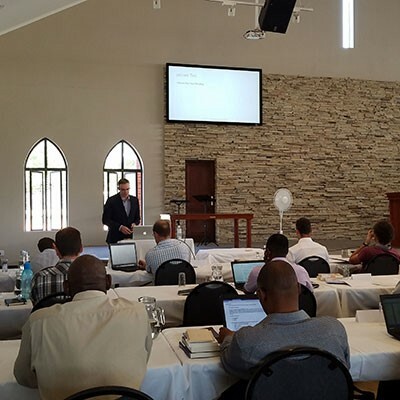 Shepherds' Seminary Africa is a long-awaited, much-anticipated initiative of various TMS grads in South Africa in answer to the critical need for more pastoral training for the rapidly expanding number of churches. Shepherds' exists to assist local churches in entrusting biblical truth to faithful men who will be able to teach others also (2 Timothy 2:2). We seek to train and mentor men to shepherd the church of Jesus Christ by teaching them the exegetical, theological, and practical skills necessary to be excellent students of Scripture, accurate expositors, capable biblical counsellors, Christlike leaders, and competent administrators in caring for the flock. We are especially focusing on working men who need a night school format, and who desire training at the M.Div. level. Thank you for praying for us and partnering with us in this great cause! Don't hesitate to let us know if you have any questions: robin@shepherdsafrica.co.za. Visit our official web site at http://www.shepherdsafrica.co.za.